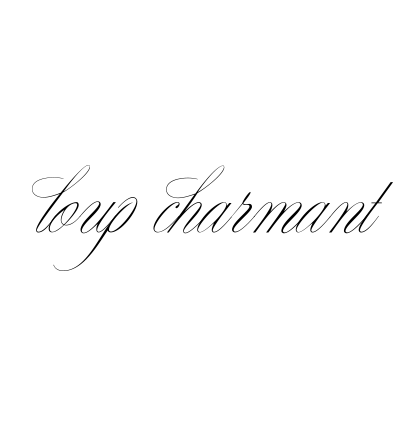 l o u p * c h a r m a n t: Heather Heron, eco pioneer shares her love for Loup Charmant. Heather Heron, eco pioneer shares her love for Loup Charmant. It’s our pleasure to feature an interview with Canadian-born, LA-based designer Heather Heron, whose environmentally inspired and friendly handbags and accessories fuse inner and outer beauty. Heather uses organic European hemp and hemp-silk blends — which she sources herself to ensure the utmost in sustainability and quality — as foundational materials for her creations. She then collaborates with local artisans to introduce fine detailing and other touches that elevate her designs to unique and elegant objets d’art. Her creations are ultimately expressions of what she believes in: beauty, nature, collaboration, and love. Here’s our interview with the lovely Ms. Heather Heron. S. Statement: A Style Statement fundamental is “communicate who you are in all you do.” How does your work help you to express yourself? In other words, what parts of yourself are you manifesting in your work? HH: I have the most beautiful opportunity to express myself through designing pieces that reflect my lifestyle. Specifically manifesting the parts of me that are modern + hippie, feminine + masculine, dreamy + practical, my activism for hemp + my love for adventure. S. Statement: When you think of style … say someone very original and charismatic, or some place you’ve been that felt refreshing, new, and real … what comes to mind? HH: My most incredibly chic friends + colleagues. I feel very blessed to have this circle of inspiration as my tribe. S. Statement: What’s a completely outrageous thing you would like to own? S. Statement: What’s something you have right now in your life that you love passionately? HH: My Leica camera … loving getting back behind the lens again after all this time. S. Statement: When you need energy, what do you do? HH: Schedule FUN into my week … if I have time, space, adventure + fun scheduled I am immediately energized. S. Statement: When you crave calm and peace, what do you do? HH: What I am doing right now … go to Canada + rest + snowboard + … slow it all down … and then go slow it down some more … until everything looks and sounds different. S. Statement: At your most comfortable, what are you wearing? HH: My husband’s Carhartts all rolled up + Loup Charmant scoop tanks layered and Le Labo perfume. S. Statement: At your most glamorous, what are you wearing? HH: My 1920s wedding dress … insane couture gown that I have enjoyed many glamorous evenings in beyond my wedding night. S. Statement: If you could only wear one outfit for the rest of your life, what would it be? HH: Loup Charmant dress, gauze scarf from the Environment by Heather Heron Collection, Rick Owens sweater, Fiorentini Baker boots + dripping in Kathy Rose jewels. Lovely 'spotlight interview' - thanks for the introduction.